CMI’s Dr Tas Walker and Dr Don Batten answer questions about whether soft-bodied fossils are viable in the global Flood, and how plants survived the Flood. The fossils that were found suggest the creatures were very similar to octopus species that are alive today. The article in effect exclaims ‘gosh, how on earth could this event happen?’. But it clearly did—they are not alleging that the fossils are ‘evolutionist’ fakes. The writer tries to sow doubts and then imply that the puzzle can only be solved if you assume the fossils are less than 6,000 years’ old. The mainstream science explanation is that these individuals were—unusually—in (temporarily?) anoxic conditions and sank to the bottom uneaten and became buried (NB this burial process did not-as the Creation Ministries International email mentioned below misleadingly suggests-take place “over millions of years”, even if the fossils themselves are millions of years old). Note that when the article states “But lack of oxygen is no preservative” experiments with fish carcasses show that even in the absence of oxygen they still disintegrate on the ocean bottom” the footnote provided is from a creationist source. The following sentence states “Other scientists have published research showing that the ocean floor is actually teeming with bacterial life”-this links to a ScienceDaily.com article. However, strangely the link is not ‘live’. This is probably because the article in question-see [Web link removed as per feedback rules—Ed. ]-whilst it uses the term ‘barren’ in its title—is NOT specifically discussing anoxic conditions (it’s true of course that bacteria don’t require oxygen for respiration as they do this anaerobically). I think the real surprise highlighted in the article is that bacteria are found very deep down where there is no sunlight-and perhaps little carbon too-so they cannot photosynthesise for food purposes but instead have to feed on chemicals. The lack of oxygen (and high pressure and cold temperatures) are incidental and not the main consideration. I receive ‘supporter’ emails from CMI. This is because I had to go to them to purchase a copy of The Greatest Hoax on Earth? Refuting Dawkins on Evolution by Jonathan Sarfati which I wanted to view last year. 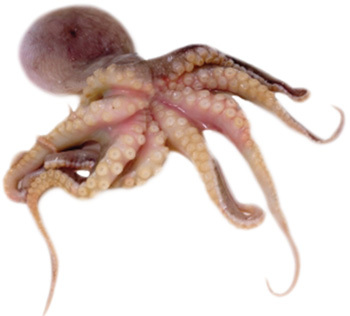 Believe it or not, the Garry Graham article is flagged in the email with the following headline ‘Octopus fossils-evidence for a global flood’! What nonsense. Although it is intelligent, the octopus does not yet live on land but remains in the sea. The fact that some were fossilised shows that they were fossilised under the seabed, simple as that (they were found in Lebanon because sea levels have since fallen). One might as well write: “if fossilisation is rapid, how could ‘soft’ animals like squid and jellyfish be fossilised in incredible detail?”. But that would not suit their 6,000 years (flood 4,500 years’ ago) YEC agenda! The fact that some species scarcely evolve over millions of years does not of course disprove the theory of evolution or the modern evolutionary synthesis as it is often known. And how would a worldwide flood rapidly bury-either under the ocean or on land-octopi that were already living in the ocean (and would not be killed by a massive flood unless the ocean somehow lost its saltiness). Or if they were killed by being stranded upon (now lifeless) land as the ‘floodwaters’ receded, how did the said flood manage also to bury them? Clearly the event that led to these particular octopi being fossilised (even though they are soft) was an event that did not and does not normally affect the species. If a worldwide flood was the culprit more would presumably found and they would only be thousands and not millions of years old. Incidentally, the fossil appears to be a trace fossil ie a sort of imprint left in what was-previously-soft sediment. And whilst the article suggests “There are many examples of soft-bodied organisms in the fossil record”, my impression is that, proportionately, they are FEW. Otherwise why were the scientists ‘surprised’-as paragraph 2 reports? Thank you for your long message that was previously posted on Amazon and which is a critique of the article about the fossilized octopus. Surprises don’t stop people holding onto their worldview … they simply invent a rescue hypothesis so they can explain the surprise while holding onto their slow-and-gradual beliefs. The octopus fossil is a surprise because of the way uniformitarians imagine fossils formed in the past. Because of that belief Charles Darwin said, “No organism wholly soft can be preserved.” He used that idea to explain why intermediate forms were not found, and that concept is taught in geology courses today—the incompleteness of the fossil record and only the hard parts are preserved. This octopus fossil is something that uniformitarians did not expect from their way of thinking. But it is not a surprise when you start with the idea that the recent catastrophic global Flood described in the Bible, and preserved in the stories of diverse cultures around the world, was a real event. Surprises don’t stop people holding onto their worldview. As you have demonstrated in your email, they simply invent a rescue hypothesis so they can explain the surprise while holding onto their slow-and-gradual beliefs. There are lots of examples of soft-bodied fossilization: e.g. Hundreds of jellyfish fossils! You said “The fact that some species scarcely evolve over millions of years does not of course disprove the theory of evolution or the modern evolutionary synthesis as it is often known.” Non-evolution is given a name: it’s called stasis. And paleontologist Stephen J Gould said in effect that stasis is a major problem for gradualistic evolution. Mutations in the DNA are occurring at a regular rate and it is claimed that these mutations have turned dinosaurs into birds, land mammals into whales, and apes into humans. If this is true then it beggars belief that no change occurred in this octopus. Actually, mutations lead to the extinction of species. Check creation.com store for John Sanford’s book and DVD on “Genetic Entropy”. He demonstrates that mutations do not lead to new species but to genetic error-catastrophe and concludes that evolution is falsified. 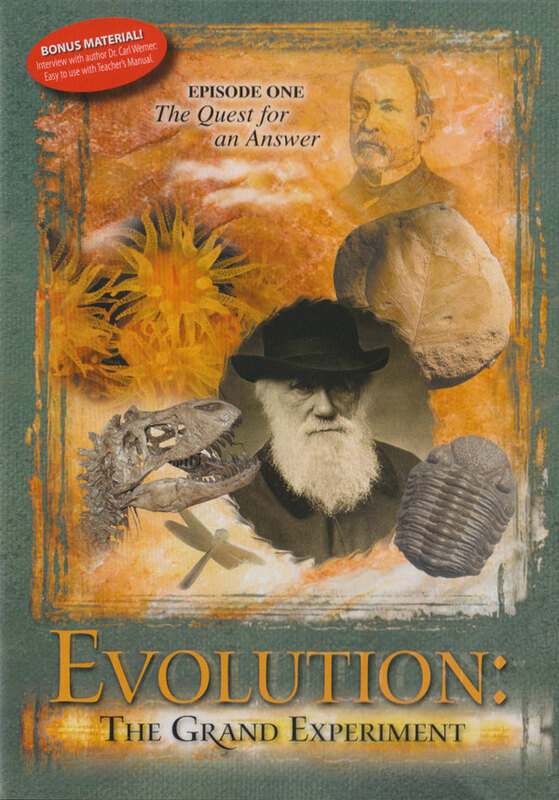 Another book that you should look at is Living Fossils—Evolution: the Grand Experiment by Carl Werner. 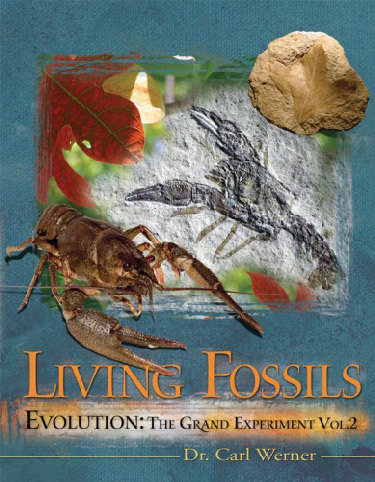 “Living Fossils” is one of two books. He has also produced a good DVD. Werner began with the hypothesis that: “If evolution is false then you would expect to find modern plants and animals in rocks of ‘dinosaur age’.” He knew of none but he and his wife have travelled the world visiting museums and dinosaur digs to see if there were any. They have uncovered information that most people are not aware of. He found that the Mesozoic rocks contain thousands of examples of modern plants and animals. The museums have thousands and thousands of these fossils but they are not usually put on display or shown in their dioramas of the ‘Age of Dinosaurs’. This discovery was a surprise to Werner and he claims it is a very powerful argument that evolution is falsified. The fact that you have posted on Amazon and taken the time to write to us confirms that this is not just an academic issue to you. Who argues over the mass of the electron or the temperature of the sun? If the Bible is true and the Creator God is real that has implications for you and for me. If you and I are made in the image of God then that affects the purpose why we are here, the way we should live our lives, and the options for our future. I think a person’s relationship with their Creator is the most important thing in life. I guess that is what Jesus meant when he said the first and most important commandment is to love the Lord your God with all your heart, with all your soul, with all your strength and with all your mind. Thanks for writing. May God bless you and bring you to himself. Hi I am a creationist/Christian and I have recently seen the fury of flooding waters in the area of Queensland Australia. If the force of water of inland tsunami’s caused by torrential rain as seen in Toowoomba, QLD, can cause so much damage including washing away houses that were built on concrete slabs, then how much more damage can be caused by a major flood on a worldwide scale. Seeing the damage of a freak inland tsunami in Toowoomba, which by the way is a city built at the top of a mountain range has caused me to realize the potential of larger walls of water that could have happened when it rained for the first time in Earth’s history at Noah’s time. Imagine a canopy of water falling from the sky as well as wells/springs bursting open from the underground then you could see how a worldwide flood such as in Noah’s time could have happened. Also how is it? That wild animals have been seen from time to time to forget their natural hunting instincts during major natural disasters as rabbits and foxes flee from their habitats together to survive. I have seen a picture of a snake swimming down floodwaters with a frog hitching a ride on the back of it. Could that be God directing them to safety as it was similar to the animals being led two by two to the ark. Worldwide floodwaters would have to be strong enough to pick up a large boat like the ark from dry land to be floating on water. God’s promise of no more worldwide floods that would destroy everything tells me that Noah’s flood wasn’t just a small local flood but a worldwide one. One question I do have regarding Noah’s flood-of all the trees, herbs, flowers & weeds that would have drowned in the flood, would they have hibernated or remained doormat carrying seeds to be ready for when the waters came down? Or would the drowned seeds have died maybe some and not all. With all the waters rushing widely couldn’t all seeds have been carried to every continent and every place which would mean that all plants today would have seemed to be on every continent and not native to any continent. What is the theory or knowledge behind this idea? Did Noah take all seeds on board the ark including weeds? Did some plants/ trees not grow simply because they were not in the right environment? Thanks for your enquiry and for encouraging us in being a creationist Christian! Searching creation.com for <survival plants> turns up several articles, including: How did fish and plants survive the Genesis Flood? and Chapter 14 of the Creation Answers Book. 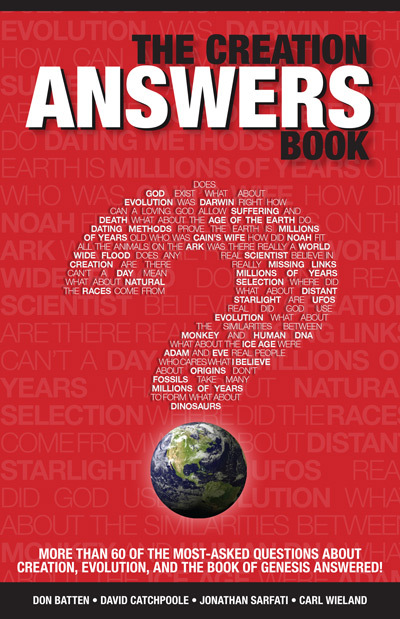 I strongly recommend you purchase this book, which answers over 65 questions that people ask about Creation, the Fall the Flood and the Tower of Babel, etc. This also came up, and is worth reading: Revisiting a ‘worthless’ explanation (an answer to a person sceptical about the Flood and plant survival). Plants are only weeds when they grow where we don’t want them to. One thing that has possibly not been answered is your idea that plants should be worldwide in distribution. Actually, because of the spin of the globe, southern hemisphere and northern hemisphere water currents are fairly well separated. So plants that got uprooted (or seeds) in the southern hemisphere would tend to stay in the southern hemisphere. This is what we find: for example, some plants in South America, Africa and Australia are clearly related. Weeds? Plants are only weeds when they grow where we don’t want them to. Some plants regarded as ‘weeds’ are very valuable in stabilizing soil in eroded situations (e.g. beach dunes). Others are actually eaten in parts of the world, or used for herbal medicine. Some of our valuable crops have been once regarded as weeds (e.g. canola). But one of the reasons that something gets known as a weed is that it is tenacious and good at surviving. By the way, the Bible does not teach that there was no rain up until the Flood. This is covered in Chapter 12 of the Creation Answers Book and also in our ‘Don’t Use Arguments’ article. How did fish and plants survive the Genesis Flood?